All children deserve the opportunity to discover who they are and what they can achieve, under the guidance of adults who care about them and believe in their potential. The Y offers an environment where children learn values and positive behaviors that build strong foundations to becoming successful adults. The YMCA of Metro North provides preschoolers with high quality early education and care to support their development cognitively, socially, emotionally and physically. We offer youth and teens throughout our diverse communities a safe, engaging and nurturing environment during out-of-school time hours that prepare them for success in school and life. The Y equips teens with skills to be leaders of tomorrow through programs like Leaders’ Club, Kaya and Teen Leaders Camp Programs. Our branches work to prevent drowning by teaching children basic swimming and water safety skills through our outstanding aquatic programs. GIVE to support the YMCA’s Youth Development initiatives. Twelve year old Taima Walker had just moved to Lynn when a friend suggested she try the Y to meet people in her new hometown. 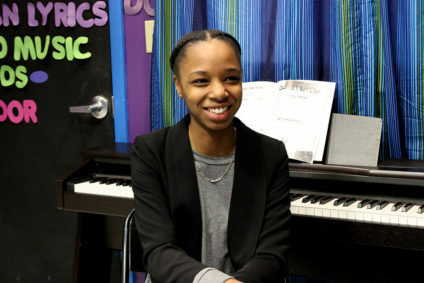 Taima wasn’t sure what to expect when she walked in the door of the Lynn YMCA Music Studio Clubhouse, which provides free music education and production to youth ages 8-18. She came to listen to music and hang out with her new friends, but never imagined that the Y and the Music Studio would end up being so much more to her. As she started to volunteer in the Music Studio, Taima found her passion for helping others while developing responsibility and leadership skills. She learned how to interact with people, allowing her to gain confidence in herself and her abilities. “I wanted to work with children and teach them what I knew, because to me music is the best thing ever and why wouldn’t everyone want to feel this way about music,” Taima says about her motivation to take on a leadership role. Now a 15 year old sophomore at Lynn Classical High School, you can find Taima in the Music Studio every day after school, nurturing the young Lynn musicians of tomorrow. As soon as Taima walks in the door, there are 5 or 6 kids trailing behind her asking when she is opening the studio. She designs new plans for each day to teach the children varying aspects of music, from playing the piano, to drum circle, to song writing. At the same time, she teaches them to believe in themselves, guides them to try new things and explore their creativity, while discovering their own passion for music.